Often when we find ourselves struggling with fear or constant worry, it’s hard to even know what to pray. Words seem far away and our thoughts can too easily get lost on what’s pressing in, overwhelming us. But here’s what we can hold onto even in those difficult times: God understands. He hears us, and He is close, always. He reminds us to draw near to Him and find mercy and grace in times of need. He assures us of His constant Presence, surrounding us, leading us, giving us peace that doesn’t even make sense to the world. We just have to choose to come to Him. To ask Him for help. The key to powerful prayer isn’t found in using just the right words, but in a heart seeking after God, who makes the time to just pray. A life without prayer and faith in God is a life that says we somehow think we can do better on our own. It says in the face of the God who made us and loves us that we don’t really believe He’ll do what He says He will do. It says that we desire to remain fully in control of our lives and circumstances. The problem is, that belief will lead us straight towards fear-filled days and troubled times. We just weren’t meant to carry it all. Nothing will bring us peace in this world except Jesus Himself. And to say we love Jesus, yet never pray or choose faith in Him is hardly possible. Our faith is never dependent on us, our faith is dependent on the One who is faithful through all generations. We may fail, but God never will. He promises to help us, and He assures us that He will strengthen our faith and perseverance, even in the toughest of times – especially in those times. Because He understands how weak we are, how needy of Him we are day by day. Jesus Himself was there while facing the journey to the cross. 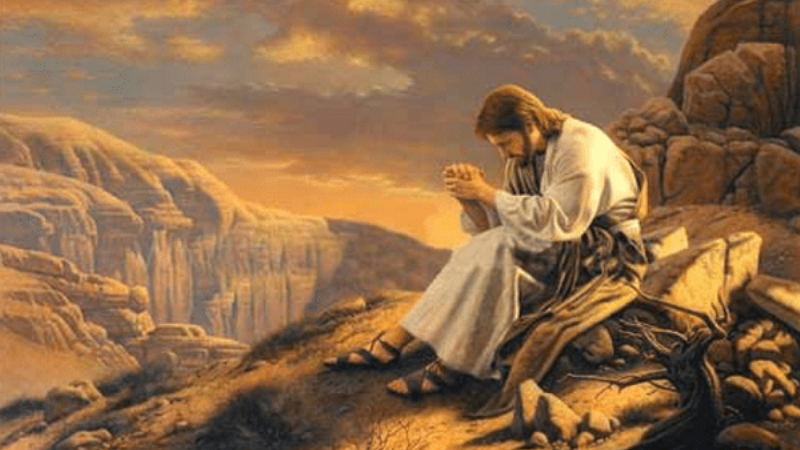 He prayed all night in the garden, all alone. Many had deserted Him; His own disciples had fallen asleep in the most troubling of hours. I can’t even imagine the anguish of soul He must have felt, but it’s evident through His words and verses, that He poured out all He had before His Father. He was deeply troubled, to the point of death, and it was in those moments He prayed powerful faith-filled words. He didn’t allow fear to have victory over that crucial time. He didn’t give way to temptation and go His own way. He remained steadfast, with heart-felt, faith-breathed words to the One who loved Him so (Matthew 26:36-56). The greatest, most powerful words we could ever pray are God’s very words back to Him. They are truth and light in a dark world and troubling times. God promises in Isaiah 55:11 that His word will not return empty, without accomplishing great things. The fear we’re facing seems insurmountable. We don’t even know what to do anymore, we feel confused and uncertain about the future. We wonder sometimes if you’re really listening, life seems to have taken us so far away. Please help us to come back to you. Bring us safely under the shelter of your wings. We long for your presence and peace again, but we’re not sure how to get back. We trust that your power is far greater than the difficulties we’re up against. We believe that you are mighty and that you’re bigger than this storm. Thank you that you promise to be our refuge and strength in times of trouble. We ask you for a miracle right now and depend on you as never before. Please help. In the powerful name of Jesus, we don’t even know what else to ask but those two words. Please help. We know that you are able, and nothing is too difficult for you. For the times we’ve been carrying burdens and troubles all on our own, so loaded down with cares we won’t let go of, would you please forgive us? Would you help us to release those things we weren’t intended to hold onto? It’s hard to let go. It’s hard to forgive others for those times they’ve hurt us. It’s difficult to fully trust again sometimes. And that shows us we don’t have the faith in you that you’ve asked us to have. Fill us fresh with your Spirit and give us the faith to believe that you are forever true to your promises, that you are fully trustworthy. We ask that you would open doors that no one could shut, we ask that you would close the doors tightly that never need to be opened again. Help us to stop wrestling, help us to stop trying to work it all out in our power. We’re tired and weary. We’re drained. We’re facing discouragement at every turn. Yet we believe you are a miracle working God, and we thank you that you are fighting for us today, even behind the scenes where we can’t fully see. Thank you that you see the big picture, that you know far more than we’re even aware of. We trust you in that. We pray for your will to be done and not our own. We choose to find rest and joy in you today. Thank you for your goodness and favor over our days. Thank you that you give us great hope and purpose for the future. We lay it all down before you, again. Thank you for your presence with us, thank you for your Almighty Shadow. Thank you that you go before us and cover us from behind. Thank you that you are in our midst, and our future is secure in the place you’re preparing for us. We choose faith over fear today. We choose to set our eyes on you and not on our circumstances. We choose joy over despair. We choose peace over worry. Silence the lies of the enemy over us. Give us the awareness we need to step over his traps. We trust you to protect our way and bring us safely through the trials we’re facing. Your words bring hope to our souls and comfort to our hearts. Remind us of your strength today, in us, through us. May we see glimpses of your glory and blessing along the way as we seek after you. For victory and salvation are found in you alone. It’s me again. Struggling with the same things I seem to always be wrestling with. I’m afraid. I’m worried. I feel anxious. I’m overwhelmed. But in this darkness, help me to see your light. By faith I believe, you’re breaking through all the mess, all the brokenness, all the shame, all the stuff that tries to keep me trapped in the old patterns and former ways. By faith I stand strong in you. By faith I say to the darkness and lies, “No more, no way.” By faith I declare that you are greater than any struggle, any problem, any difficulty I may face here on this earth. Lord, I believe you’re made me for your unique purpose and plan. And I’m choosing to follow closely after you today. I’m listening for your voice and watching for the ways you’re at work. I’m breaking up with this unhealthy relationship with fear and leaving it in the dust. I’m showing up for battle today. I’m putting on the armor of God and picking up the sword of Spirit. I know you are with me and you fill my days with your strength and power.